Manganese Blue is a brilliant, clear, semi-opaque to transparent blue pigment with a greenish undertone. Its saturation and texture varies across manufacturers. 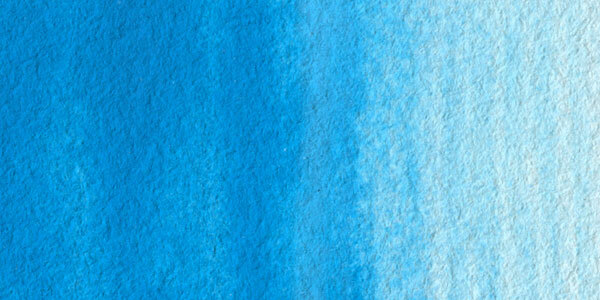 Manganese Blue has excellent lightfastness in watercolor form. Manganese Blue can be highly toxic if inhaled or ingested, causing nervous system disorder. Manganese compounds have been in use as pigments for more than 17,000 years. The Egyptians and Romans commonly used them in glass-making. The synthetic variation was officially patented in 1935, but neither the original nor the synthetic is commonly produced today, as Manganese Blue has been replaced on the artist’s palette by more intense blues. Most brands offer a Manganese Blue made from Phthalocyanine Blue. 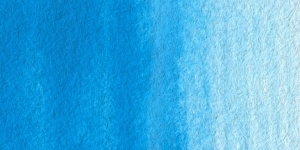 Appropriate substitutes in watercolor form are the rare Peacock Blue, Phthalocyanine Blue (Green), or Phthalocyanine Blue lightened by Zinc White.